Love your dog with all their heart! Kenny our store manager based at both our Goring & Ferring stores, runs you through some heart based hints and tips for your dog. As Valentines is fast approaching, we’re talking about heart health at Browns Natural Pet Store. There are many ways to keep your dogs heart in tip top shape, including regular and varied exercise, a good diet and giving supplements. Here are our suggestions of what you could trial, to help boost your pooches vitality. Sweet potato is a nutritional powerhouse so it’s no wonder it’s good for one of the most important organs! Sweet potato is packed with antioxidants and potassium- vital for keeping sodium levels under control in the body. 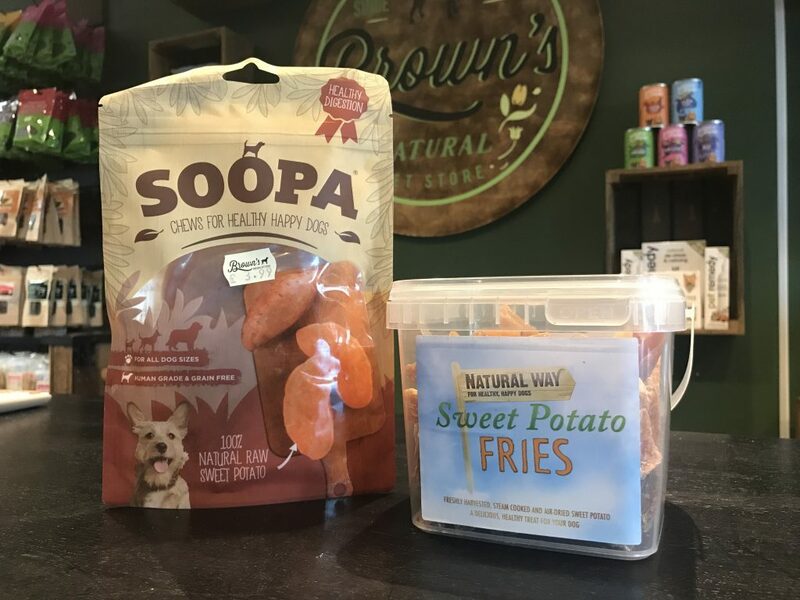 Dogs love these chewy snacks from Soopa and Natural Way. Don’t forget you can always gently cook it fresh and add to your dogs dinner, or stuff it in a Kong (add a little bit of ginger too to aid digestion and stimulate circulation!). Leafy green veg and berries are essential for maintaining a healthy heart, and the Nature’s Menu nuggets are a great way to get them all in one. Raw and finely blitzed, they’re blended to be easily digestible and are also suitable for grain free and raw diets. 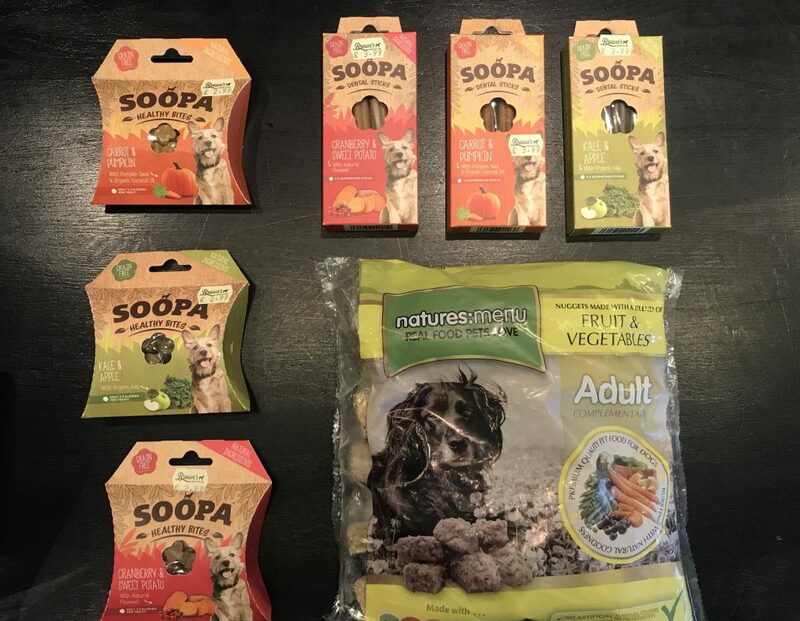 If you’d prefer a treat, try the Soopa healthy bites or sticks, as they’re full of antioxidants that support heart function. Taurine is an amino acid found in muscle meat, particularly abundant in lean beef and oily fish. It helps to regulate heart rhythm and blood pressure, hence why a raw diet or a diet comprised of predominantly fresh meat is essential for dogs and, more so, cats. 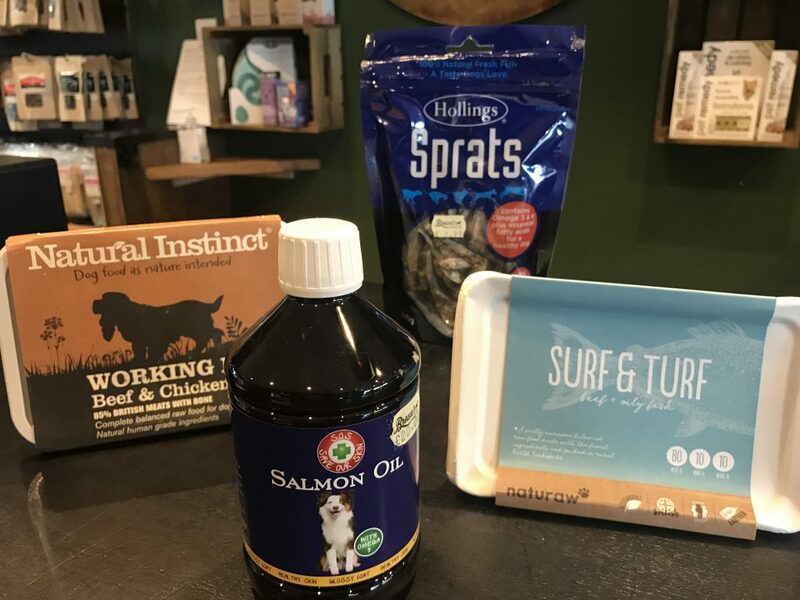 Try Natural Instinct Working Beef or Salmon, or go all in one with Naturaw Surf and Turf! If your dog prefers dry kibble or wet food, add in some Fish4dogs salmon oil to get those Omega oils in. If you’re in to your herbal remedies like we are, visit the pharmacy section at one of our Goring or Ferring stores! 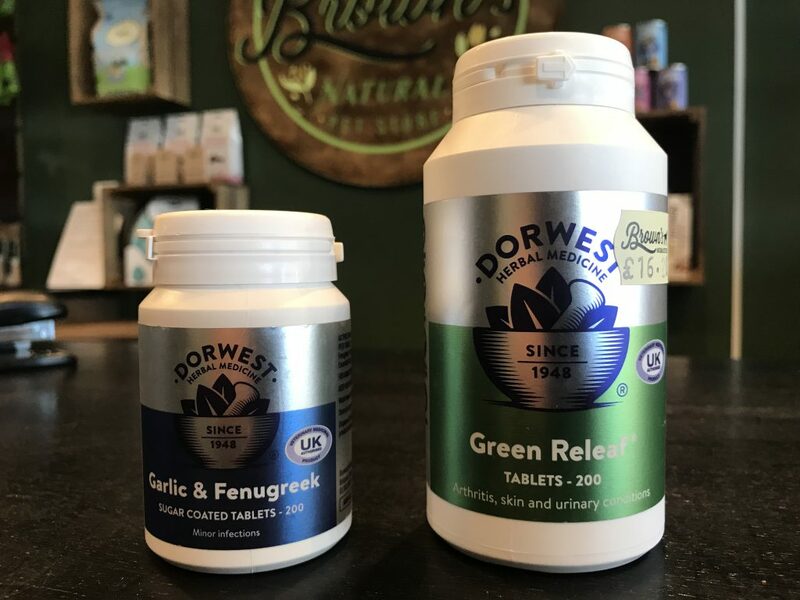 Along with many other benefits, the Dorwest Garlic and Fenugreek tablets help remove fat from the arteries, and can reduce blood pressure. Alternatively, try Dorwest Green Releaf tablets or Easy Green powder. Both are rich in leafy greens, especially parsley which is a natural diuretic and can help to reduce fluid built up around the heart. Remember all of the Browns Natural Pet Store consultants are trained to advise you – so pop in to see us at one of our stores, or contact us on social media! We look forward to speaking with you.